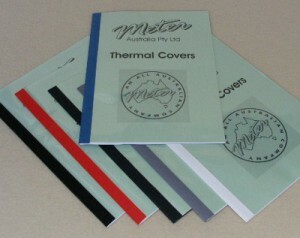 Meter Thermal Binding Covers will protect and enhance your presentations, documents, reports and manuals. Meter Clear Front, Black Leathergrain Back Thermal Binding Covers have a crystal clear 150 micron front cover and a 200 gsm Black cardboard back. Meter 4mm Black Thermal Binding Covers will work well in all brands of Thermal Binding Machines (that don’t require special steel covers).